Found one file extension association related to WM Recorder and 1 file format developed specifically for use with WM Recorder. 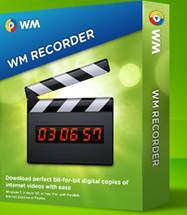 Developer / company: All Alex Inc.
WM Recorder is the easiest, most powerful way to record millions of video and audio files from the internet. Just open WM Recorder, play your video or audio, and it's saved automatically. If you need more information please contact the developers of WM Recorder (All Alex Inc.), or check out their product website.